Use the popular tom yam paste to add some oomph to your dishes. It’s versatile enough to adjust: if you like it mild, use less, and if you prefer to hear a ringing in your ears when you eat, put in an additional tablespoon! This recipe was first published in Amy Beh’s column, Cook’s Nook. Cook angel hair spaghetti to al dente according to packet instructions. Heat oil and sesame oil in a wok. Fry dried prawns and lemon grass till fragrant. Add tom yam sauce mixture and continue to fry briefly. Add carrot and toss to fry gently. Put in spaghetti and fry briskly to combine. Add seasoning mixture. Add bean sprouts and cabbage. Toss and fry briefly until well combined. Add kaffir lime leaves to mix. 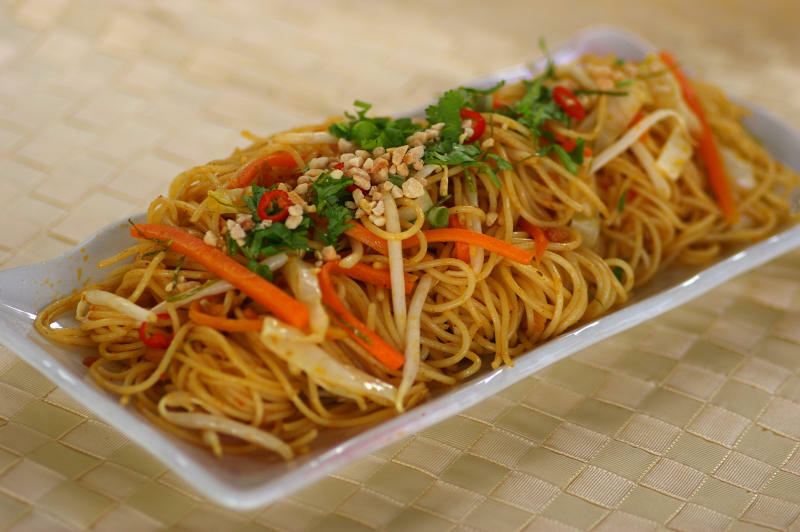 Dish out and garnish with chopped peanuts and coriander leaves.